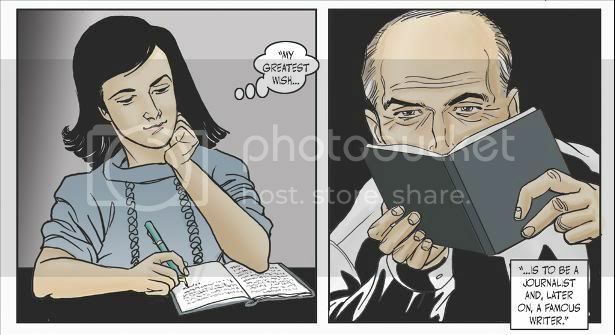 Anne Frank is no stranger to us. We all know about how she hid with her family and four others in a secret annex in Netherlands during the infamous Holocaust, for two years. Whether or not we have actually read or loved her diary, none of us would deny that she went through a harrowing experience - just as million other Jews, victimized simply because of their faith. But in so many ways, Anne has become a symbol of that period chiefly because she was just fifteen when she died (murdered is what I like to say, even if it was disease that eventually claimed her), and also because she recorded her stay in the annex in her diary, which has already been read by millions. That said, when I first read and loved Anne Frank's Diary two years back, the most common sentiment I heard expressed among those who didn't rate it highly was that the book felt too "immature". In other words, it read like any fifteen year old's diary - with all the typical squabbles, complaints, teenage infatuations/crushes/desires and worldly wisdoms. It seemed anticlimactic or too flat considering all the hype around it. I know many who tried to read it as any diary and eventually gave up. Most people loved it though, and what particularly struck me about the diary was that it was the manifestation of the dreams and desires of a girl (like any other girl), who never got to experience them, because of a man-made tragedy. From that perspective, this graphic nonfiction is a really excellent accompaniment to the diary. Many have attested that when reading Anne's diary, it is really crucial to be in Anne's position - trapped for two years in an annex with just a single bathroom and not much privacy; a young girl at the cusp of those years when she is discovering herself, every single day - the age at which any girl or boy wants to experiment with a lot of things, including love and all the desires it invokes. Add another family to that annex, a family you now had to live with for two years, or rather for an unknown amount of time. In Anne's diary, the events following their capture are chronicled in the Afterword section of the edition I read - who died and how, who survived. This book actually shows the events. Pictures can have a more powerful effect on the reader, and it did so in this case. Did you know that Anne and her sister died just weeks before rescue arrived at their camp? If she had been rescued, her diary might never have seen the light of day. But at least the world would not have missed having such a remarkable woman in its midst. I felt that this book was really well-done. I read in an interview (whose link I can't find now) that the drawings of the characters, their attires and even the layouts of the annex strongly resemble the original characters and their hideout. Towards the end of the book when everyone is captured, they all look so different from their original selves - malnutrition, disease and fatigue eating out their muscle and body mass quickly. That's something I can never get used to - all those horrific images of the camps and their inmates. How could humans be so callous? I knew before I started, thanks to Ash, that this book is not a duplicate of Anne's diary. Instead, it covers a significant period before and after Anne starts writing her diary. That's really helpful because it puts Anne's diary in context much better than the diary itself does. Suddenly, the events seem much more harrowing, more scary, vivid and dangerous than how Anne says it. And after reading this graphic book, when I recollect some of the entries from Anne's diary, I see them in a much different light. I'm posting my review of this tomorrow! I'm glad you enjoyed this, I was so pleased to read it after finishing her diary. Anne's story is really so moving. I hope you get to read this book. I'll be interested in hearing your thoughts. I'm really glad this graphic memoir was made. I felt it was so sad that many haven't read her diary. Being the very private person that I am, I'm always amazed at how Anne (and even Margot and Peter) lived in that annex for two years at an age, when there'll be raging hormones, a lot of rebellious thoughts and self-discoveries. I've never stopped being amazed at that. I wish none of this ever happened.